Based on a true story, this is in essence a cross-racial adoption story. A successful Southern Belle discovers that a black kid in her child's school is homeless, and decides to take him in. 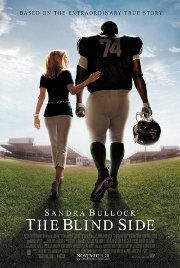 As he adjusts to his new life, she pushes him academically while the football coach is also after him for his huge size. Together, with the help of a private tutor, they develop him to the point where he can play football at college. Stop calling me Erin Brockovitch!